The beautiful city of Nafpaktos with its unique small and picturesque Medieval port, the big castle on top of the hill that overlooks the old city and the coasts of Peloponnese, the 2 long beaches on either side of the city and the narrow alleys with the traditional houses offers more than a visitor may see during a usually weekend time period. 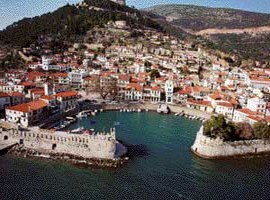 The town of Nafpaktos is not very famous or popular among comparing it with other Greek destinations. But doubtless is one of the most picturesque places on the Greek mainland. 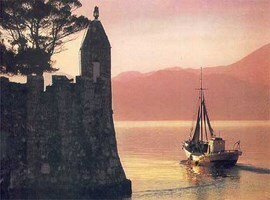 Nafpaktos has an old fashioned and Medieval atmosphere which impresses the visitors. Attractions as the charming scenery, the Venetian port and the plenty of beautiful surrounding beaches make the town the perfect destination. The port is the most prettily scenic of the town while on the hill above the town is located an impressive Venetian Castle with breathtaking view of the Gulf and the coasts of Peloponnese opposite Nafpaktos. The location of the town of Nafpaktos is ideal to start a road trip to the neighbour towns of Messolongi, Delphi, Patra, Olympia and many others. Nafpaktos is a charming town, located on the Corinthian Gulf and is a beautiful mix of rich of vegetation slopes, rocky mountains and nice coasts where the olive trees offer their cool shade. This seaside beauty is located 42km away from the historic city of Messolongi and 10km from Antirio (the town which is connected with Peloponnese by a new and modern bridge). Nafpaktos is a quite busy town, well developed for tourism with many good options for accommodation, for all tastes and budgets as well as a great variety of eating houses, restaurants and shops for the everyday needs. The town of Nafpaktos is a place for all the seasons. Whenever someone wants to visit it, always is a very good choice. The last years, Nafpaktos attracts more and more tourists thanks to its quality and its location; close to historical and popular cities, to ski resorts and not far away from Athens. Note that just 30km away is located one of the most beautiful mountainous regions of the western Greek territory, the Pindus Mountain range. To visit the Venetian Castle can be a really fascinating experience. Someone is able to imagine how were living the people and what’s the way of building in different eras. In the ancient years large stones were used as walls while during the period of the Crusaders, the people built new bastions and added a harbour inside the walls, on the remains of the ancient walls. Some decades passed and the Ottomans occupied the area and built on the top of the walls of Norman. A visit to the place can travel you back in time during both happy and dark periods of it while when you finish an aromatic coffee waits for you in the small picturesque coffee shops around. 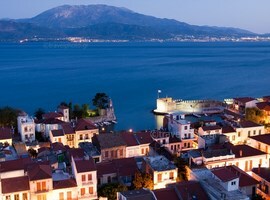 If you are in Nafpaktos, there is a wide range of activities to choose the one you like. A fun option is rafting in the river of Evinos. Every single boat can carry 5 to 8 people and is driven by the river flow. You can also take some training courses to know the basics of this adventurous sport. Another activity for high adrenaline levels is rappelling while two excellent choices for all the family members which do not require previous experience are of course the horse riding and the mountain bike in the amazing landscapes of the highland part of Nafpaktos. There is no doubt why this town has its own enthusiastic fans who come back over and over again as it combines everything someone looks for. 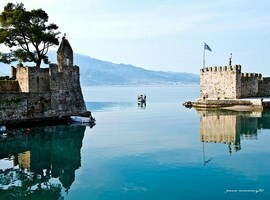 The Venetian Castle of Nafpaktos is one of the most beautiful and well preserved in Greece. From there, you can enjoy a great view of the Corinthian Gulf while you visit a place with historic importance. Its construction started in ancient years, it was continued by the Venetians and finally was completed during the Turkish occupation. The castle was protecting, during the different wars, the residents of Nafpaktos and was famous and unique for its five defensive walls, two of which were built going down to the sea and three walls were constructed at different levels on the hill between the maritime walls and the castle for maximum security. The Tower of Botsaris is located very close to the Venetian Castle and actually the construction consists of two towers. The western tower was constructed in the 15th century by the Venetians while the eastern tower was built in the 16th century by the Turks. These two towers were being used as the home of the Turkish governors of the town of Nafpaktos. After the liberation of the town on 18th April of 1829, this tower was bought by the Greek general Notis Botsaris, member of the historically important family of Botsaris who offered a lot to the Greek Revolution for independence. Today, the towers work as a museum which is full of unique exhibits from the entire history of the town. The statue of Miguel de Cervantes stands in a park near the port of Nafpaktos as a memorial to the participation of this great novelist in the sea battle of Nafpaktos which is also known as the battle of Lepanto. This battle took place in October of 1571 and put an end to the Turkish navy elicitations. Miguel de Cervantes is a great Spanish novelist, poet and playwright. The days of the battle, Cervantes was only 23 years old and was serving the Spanish army. Although he was taken down with high fever, he declined to stay behind and decided to take part in the battle. During the battle, he was shot and got three wounds; two in the chest and one in his left arm which was finally paralysed and cut off. Cervantes wrote many of his military experiences in his worldwide famous novel Don Quixote. The statue is an order to the memory of this brave man who didn’t flinch even to lose his hand to help in the battle of a country for independence. The inscription above the statue says: Miguel de Cervantes Saavedra (1547-1616), Spanish soldier, genius of letters, honour of humanity, wounded heroes of the naval battle of Nafpaktos. The beach of Nafpaktos: Actually is two beaches together; the eastern beach of Gribovo and the western Psani. Both of them are organized with umbrellas and sunbeds, showers, lifeguards, changing rooms etc. Also, the beaches are awarded with the European Blue Flag which certifies the quality of the sea water. The beach of Platanitis: This beach is 7km away from the centre of Nafpaktos and is a calm, beautiful beach, ideal for couples and families. The crystal clear waters and the unique view of the modern bridge of Rio-Antirrio and the breathtaking sunset are the characteristics of this beach. Around the beach, there are many good options for accommodation, food and entertainment. 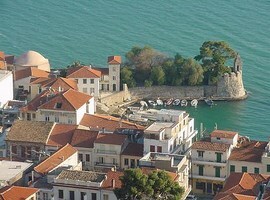 The town of Nafpaktos is easily accessible by car or bus. There are frequent routes from the central bus station in Athens. The trip lasts approximately 3 hours. If you want to travel with a car, you have to go to the city of Patra where you have two choices to reach Nafpaktos; you can pass the new modern bridge in 5 minutes and the cost is around 12 euros or to travel with a ferry to the opposite coast. The trip lasts for 15 minutes and the cost is much lower.